If you would like to learn more about any of the horses offered here, please email us for photos or more information. 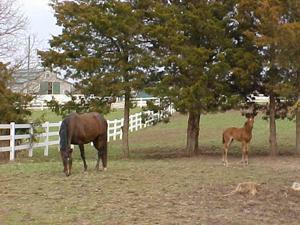 Foals running and playing are usually the first signs of spring at Iron Horse Ranch. 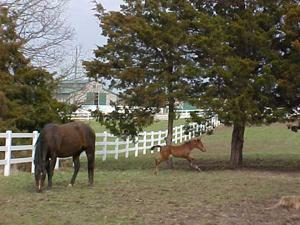 Iron Horse Ranch is a state-of-the-art facility for raising American Quarter Horses. It is located in central Missouri, near the late-1800’s railroad town of California, and about 20 miles west of the state capital, Jefferson City. We raise Quarter Horses with a variety of well-known racing, performance, and cow horse bloodlines. Our horses are available in all stages of their training and development, from weanlings to retired babysitters. In most cases, we have either raised them from babies, or had them for several years. We can tell you much, if not all, about their histories, personalities, idiosyncrasies, strengths and weaknesses, and how they function within the herd. We have no “difficult” horses. They all have to get along with each other and with us in order to live here! 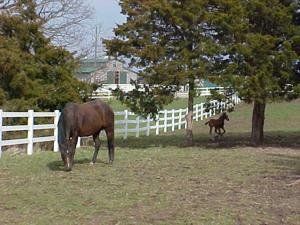 We can help you choose one of our horses to fit your needs, level of skill, and personality.